Samsung has today launched the GALAXY Note II at IFA, in Berlin. The Galaxy Note II is a whole new level of innovation for the GALAXY Note category, and it is the successor to the popular Galaxy Note. 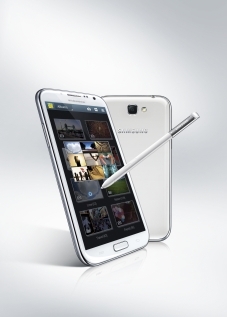 Galaxy Note II has a 5.5 inch display screen, 1.6GHz quad-core processor. The GALAXY Note II features a 5.5” (140.9mm) HD Super AMOLED screen with 16:9 screen ratio, 1.6GHz Quad-Core processor and HSPA Plus or 4G LTE connectivity, Android 4.1 (Jelly Bean) and 3,100mAh battery. Memory options are 16 GB, 32 GB, and 64 GB with an expandable micro SD memory slot. The GALAXY Note II comes with an 8 megapixel rear-facing and 1.9 megapixel front-facing camera with HD video recording. It comes with S Pen, it provides natural writing and drawing experience.